Disney World is amazing no matter who you visit with. Still, there is something extra magical about heading to these super cool parks as a father-and-son duo. After all, what could be better than bonding over the incredible experience offered by Walt Disney World Resort? If you’re thinking of taking your little man to Disney in the near future, you may be racking your brain trying to come up with a way to make the day extra special. Not to worry! We’ve collected a whole list of amazing ideas for you. Did you know that Disney World offers super cool behind-the-scenes tours? Well they do, and they are a ton of fun! For those animal lovers out there, the tours at Animal Kingdom are ideal. Plant fans, on the other hand, will adore the super affordable Behind the Seeds tour at Epcot. Other tours can be found at both other parks, and all are well worthwhile if you’ll be taking a slightly older child. Many people don’t realize that there are some great opportunities for sports fans to get in the game at Disney World. Consider staying in All-Star Sports resort for this particular trip, making sure to use the huge field in the middle of the resort to play catch, flag football, or even soccer. Visit ESPN Wide World of Sports and catch an event or simply have a look around the amazing facilities. For dinner, head to ESPN Wide World of Sports Grill located inside the complex for a well themed and delicious meal any sports fan would love. 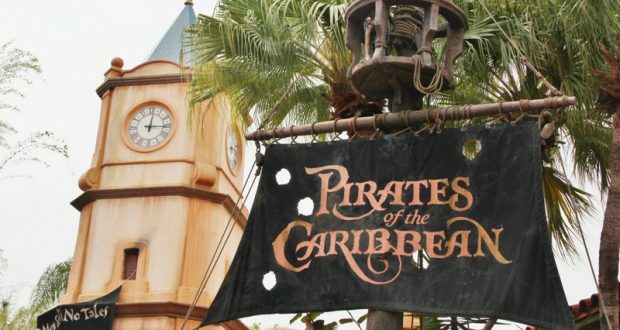 Those looking to celebrate all things pirate will find that Disney is just the place to do so. Begin by paying a visit to the Pirates League, where all guests are decked out in the finest pirate attire and dubbed official pirates. Catch the silly show featuring Captain Jack Sparrow located just outside the Pirates of the Caribbean ride, and then hop on the ride itself. To finish things off right, be sure to schedule the Pirates & Pals Fireworks Dessert Voyage. This adventure features an exciting boat ride, delicious desserts, a fantastic view of the Magic Kingdom fireworks, and even a special guest! Lots of dads golf. What many of them don’t know is that mini golf is actually the more fun version of this slow-paced sport. Why not take your son to one of the two Disney World mini golf courses and see for yourself just how fun a simple round of putt-putt can really be? Don’t forget to congratulate yourself with a delicious ice cream cone when all is said and done. Disney Springs is a wonderful location for a fun day out. There are tons of great shops to see, delicious treats to try, and even cool amusements to check out. Be sure to stop by the LEGO Store to build and race your very own LEGO car creation. Once you’re done there, pop next door and check out the enormous World of Disney store. Kids adore lunch out at T-Rex Cafe or Rainforest Cafe. Finally, you won’t want to miss the fun experiences found at AMC Theater, Splitsville Bowling Alley, and The Void. The VOID recently joined the scene at Disney Springs. With two Virtual Reality experiences – Star Wars: Secrets of the Empire and Ralph Breaks VR – this is a fantastic entertainment option at Disney Springs. Perfect for tweens, teens, and adults, The VOID is an ultimate virtual reality experience. Team up (or be teamed up) with four guests and enter the multi-sensory environment that makes virtual reality feel like…well, REALITY! This is a perfect gaming option both father and son are sure to enjoy. Many dad-and-son duos want to hit the water! For these fun seekers, the water parks tend to do the trick. Disney World is home to two water parks: Blizzard Beach and Typhoon Lagoon. Both are super fun and filled with all kinds of thrills. Pick one, put on your swimsuit, and get ready to have a blast. Have you ever thought about camping at Disney World? If not, you’re not alone, but you are missing out. You see, Disney World is home to one of the very best campgrounds in the country. Fort Wilderness is what you might call “luxury camping”. The bathrooms are clean and large, the pools are incredible, onsite entertainment is plentiful, the food is delicious, and best of all, the memories are just waiting to be made!